Plate XI. Fig. 6.—Morphine 1 : 200. 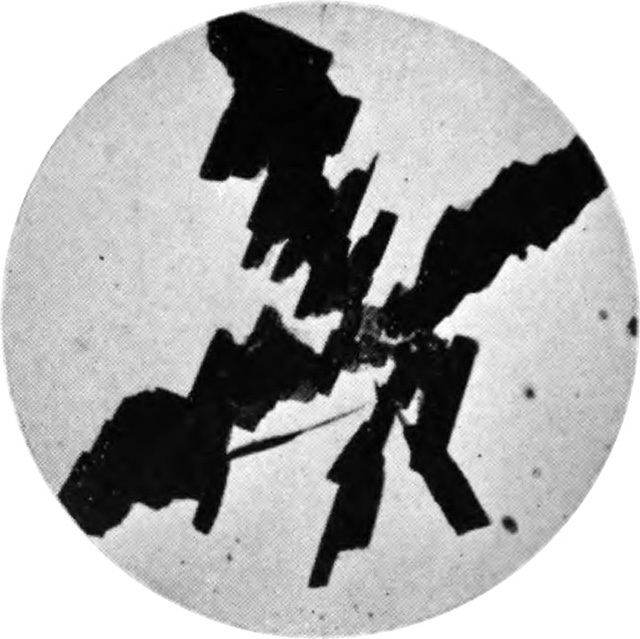 Crystals formed with Wagner’s reagent (x150). Wagner’s Reagent. — A very characteristic test, though not so sensitive as the one with Marme’s reagent. A heavy, amorphous precipitate forms reddish-brown drops before crystallization takes place, and from the precipitate crystallization takes place very slowly. ¶ It is often necessary to allow the solution to stand several minutes before crystals are formed. The crystals are large plates, reddish-brown in color, and irregular in outline. Optimum concentration is about 1 : 200.